, St. Germain ATV Club and Lakeland ATV Club connect the communities of Eagle River, Conover, Phelps, Land O’ Lakes, St. Germain, Arbor Vitae and the Arbor Vitae area. Riders can cover a variety of terrain, from paved roads to dirt routes on former fire roads. Vilas County’s ATV/UTV route system also connect to routes and trails in neighboring areas. Along with the privilege of enjoying the sport comes the responsibility of making sure you are operating these vehicles safely and responsibly. ATV and UTV operators born on or after Jan. 1, 1988 who are at least 12 years old for ATV (and at least 16 years old for UTV) must complete an ATV and UTV safety certification course in order to operate on public ATV/UTV trails and areas in Wisconsin.. For more information about ATV/UTV riding in Wisconsin, visit the Wisconsin Department of Natural Resources website. See ATVing/UTVing itinerary. The Vilas County ATV/UTV route system connects the communities of St. Germain, Arbor Vitae, Lincoln, Eagle River, Conover, Phelps and Land O’Lakes. ATVers and UTVers are relatively new visitors to Vilas County, but four-wheel enthusiasts will find great riding in Vilas County. Current routes developed by the Landover ATV Club , St. Germain ATV Club and Lakeland ATV Club connect the communities of Eagle River, Conover, Phelps, Land O’ Lakes, St. Germain, Arbor Vitae and the Arbor Vitae area. Riders can cover a variety of terrain, from paved roads to dirt routes on former fire roads. 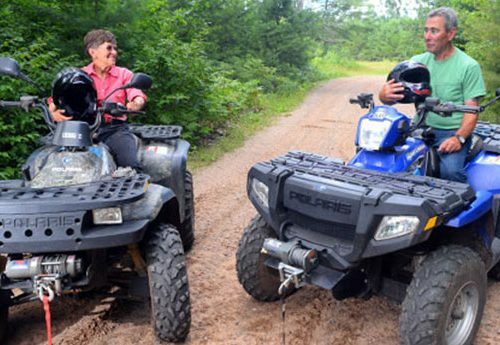 Vilas County’s ATV/UTV route system also connect to routes and trails in neighboring areas. Along with the privilege of enjoying the sport comes the responsibility of making sure you are operating these vehicles safely and responsibly. ATV and UTV operators born on or after Jan. 1, 1988 who are at least 12 years old for ATV (and at least 16 years old for UTV) must complete an ATV and UTV safety certification course in order to operate on public ATV/UTV trails and areas in Wisconsin.. For more information about ATV/UTV riding in Wisconsin, visit the Wisconsin Department of Natural Resources website.